Atlanta, GA. 5 October 2018 – Launching A3C’s “Women in Charge” programming series, the Honorable Mayor Keisha Lance Bottomssat down with renowned culture journalist, Rembert Browne, for an intimate discussion sharing her journey into becoming the Mayor, from grade school until present day. This discussion, held at the A3C Festival & Conference headquarters, the Loudermilk Conference Center, invited all A3C attendees for a complimentary brunch buffet while learning more about the new Mayor of Atlanta. Rembert asked a series of questions leading Mayor Bottoms into discussing a host of topics including her personal experiences now being a Black woman in power while still being able to identify with her community, a Black woman’s financial struggles to even make it and live in Atlanta and even touched on light hearted topics such as her surreal experience on being praised by top actor, Idris Elba, for winning the Mayoral race, even saying in the moment she couldn’t believe ‘Elba knew she was the Mayor of Atlanta’. Mayor Bottoms spoke very candid and open, connecting on a more personal level with guests on her journey. “The Mayor’s Brunch was an important event for the city and hip-hop community. We watched Mayor Bottoms have a very genuine conversation with a fellow Atlanta native, Rembert Browne, about our city and the issues surrounding gentrification, competing on a national level and supporting culture. 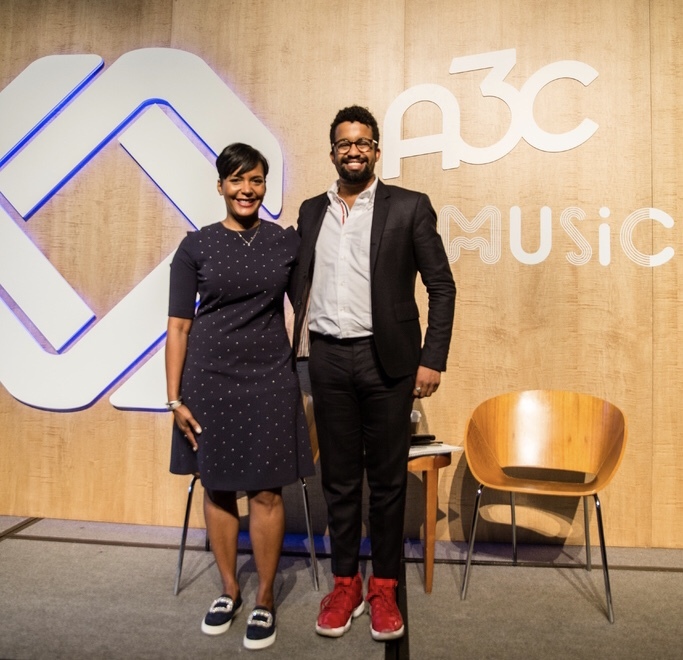 It was an honor to host Mayor Bottoms and it’s a conversation we hope to have annually at the A3C Festival & Conference,” Mike Walbert (A3C Director/Partner) states. A3C’s Women In Charge series is intended to connect, inspire and educate women in the music industry through a series of events, panels, and sessions featuring some of hip-hop’s most influential and innovative women. Women involved in this initiative include: Asya Shein (Fusicology, President), Dia Simms (Combs Enterprises, President), Dina Marto (Twelve Music & Studios, Owner & Founder), Ethiopia Habtemariam (Motown Records, President), Janee Bolden (BOSSIP, Managing Editor), Lola Plaku (Lola Media Group, CEO + Owner), Malita the Mogul (Mogul Mentality, Founder + CEO), Nicole Bilzerian (Interscope Geffen A&M, SVP Head of Urban Marketing), Nicole Wyskoarko (Interscope Geffen A&M, EVP Urban Operations), Phylicia Fant (Warner Bros Records, SVP Media + Special Projects), Uwonda Carter Scott (The Carter Law Firm, Attorney + Owner) and Whitney-Gayle Benta (Spotify, Head of Talent Relations). Learn more about A3C Festival & Conference at: www.A3CHipHop.com.